Earlier this year, Management Coach Alan Clark led a session at the first Worcestershire Innovation Network (WINN) ‘Great Things’ innovation networking event at the Hive. 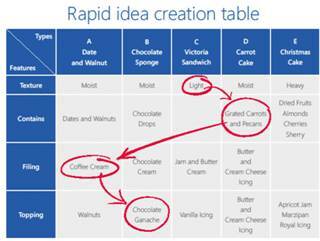 The subject of his session was the Rapid Idea Creation Table (photographed). It can be a challenge to generate innovative products or services that would be the foundation for future success. Alan’s well-received hands-on session introduced a simple tabular approach that uses the features of existing products or services. New combinations of features can provide the starting point for discovering possible innovations. Taking the features of existing cakes, the example photographed shows how simple yet powerful even an ordinary table can be for stimulating new ideas. This simple example could offer you possibly a thousand new combinations to consider. Even if most or all combinations are not practical, the whole exercise often helps kick-start new thinking.